Houses: who has stopped buying them? Lizzie Drapper and Hasdeep Sethi. In 2006, 64 English houses in every 1000 changed hands. Three years and a credit crunch later, this had halved to only 32 transactions per 1000 houses. Since 2009, transactions have recovered, but remain well below their pre-crisis level (Chart 1). 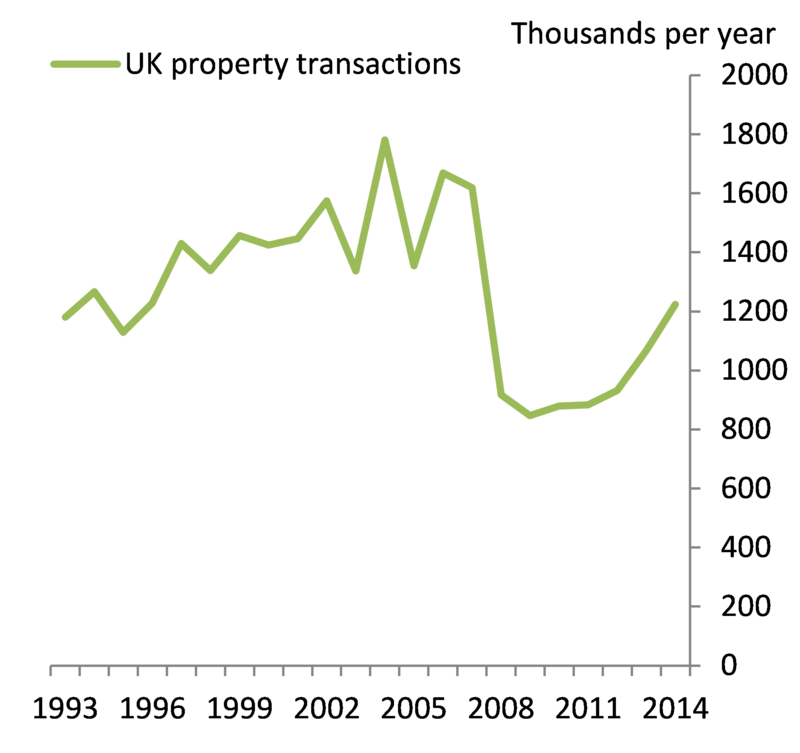 Transactions are a key metric of the health of the UK housing market and can be seen as a measure of “liquidity”. The reasons behind low transactions levels may also provide further insight into people’s behaviour and view of housing in the UK. In the work set out below, we conclude that it is unlikely that transactions regain their pre-crisis level any time soon, because of affordability constraints for first-time buyers and fewer discretionary moves by existing owners. We demonstrate these important shifts using data from two household surveys. The English Housing Survey (EHS, formerly known as the Survey of English Housing) has been running since 1993 and asks households a variety of questions about their housing circumstances. These data can identify first-time buyers and home-movers and shows that the fall in transactions was apparent across both groups although the latter group fell further in relative terms. The NMG survey, commissioned by the Bank, included housing questions in 2015 and so provides a more timely update to augment the EHS results. Households with a head aged under 35 saw their share of transactions fall by most following the crisis. Chart 2 and Chart 3 show this split by age group for first-time buyers and home-movers respectively. For first-time buyers, the fall was driven almost entirely by households with a head aged between 18 and 35. While the number of new young homebuyers did decline in the decade before the crisis, it halved between 2007 and 2008 and has only recovered modestly since then. For home-movers, the decline was more evenly spread across those under 70. Chart 2: How old are first-time buyers? Chart 3: How old are home-movers? The number of people who have no intention to buy has increased since the financial crisis. The EHS asks private renters whether they ever expect to buy a house in the UK; their responses are shown in Chart 4. Before the crisis, the number of households with no intention to buy remained roughly constant at just above 600,000. However, by 2013, this number had reached around 1.5mn which equates to roughly 40% of private renters. And the NMG survey results show an even higher level in 2015 (although comparing across surveys is difficult as we do not know how well the samples match). 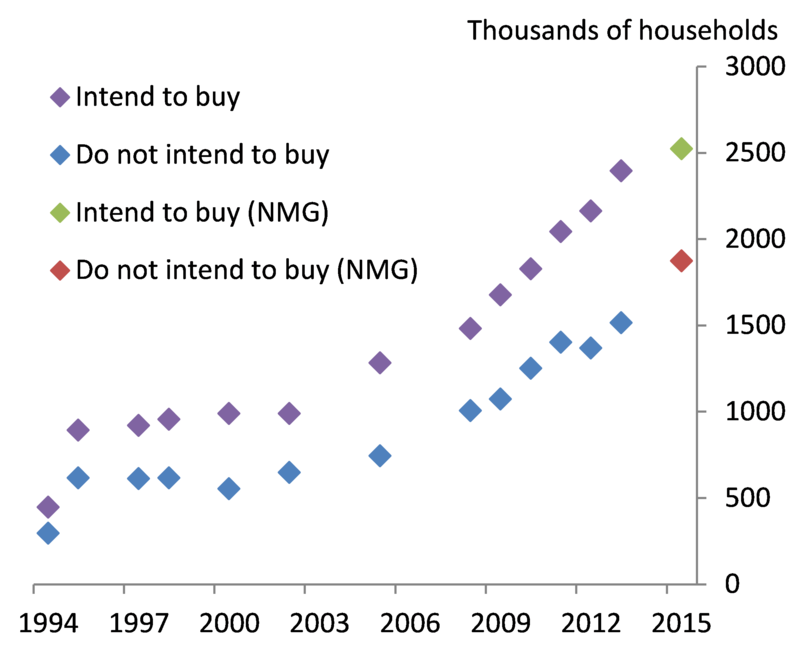 It is worth pointing out that the number of households intending to buy has also increased. However, unless the relationship between these changes then the number of transactions is unlikely to increase, ie if fewer new households intend to join the housing market then the total volume of transactions will be lower as fewer people are working their way up the housing ladder. Chart 4: Do private renters intend to buy a house? Chart 5: What reasons do renters give for not intending to buy a house? 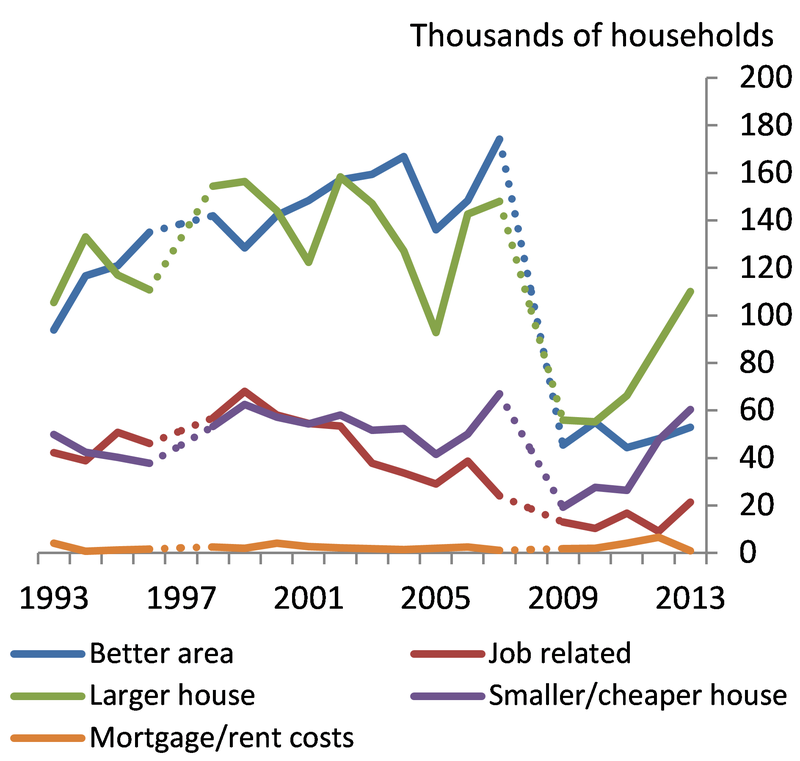 When asked why it is the case that the renter does not intend to buy a house, affordability is chosen most often – perhaps these households have been permanently priced out of the housing market (Chart 5). Wanting the flexibility of renting is only stated around 10% of the time. The 2015 NMG survey paints a similar picture and also allows us to break down affordability into whether it is the purchase costs or the monthly repayments that are acting as a constraint. There is a large group for whom both of these factors play a role, but purchase costs (ie deposit, stamp duty) are mentioned more often. In addition, the NMG results suggest that a large proportion of renters feel they are unable to obtain a mortgage, perhaps but not necessarily due to affordability reasons. This lends some weight to May Rostom’s view that the level of debt of younger groups has decreased due to an increased difficulty of borrowing. 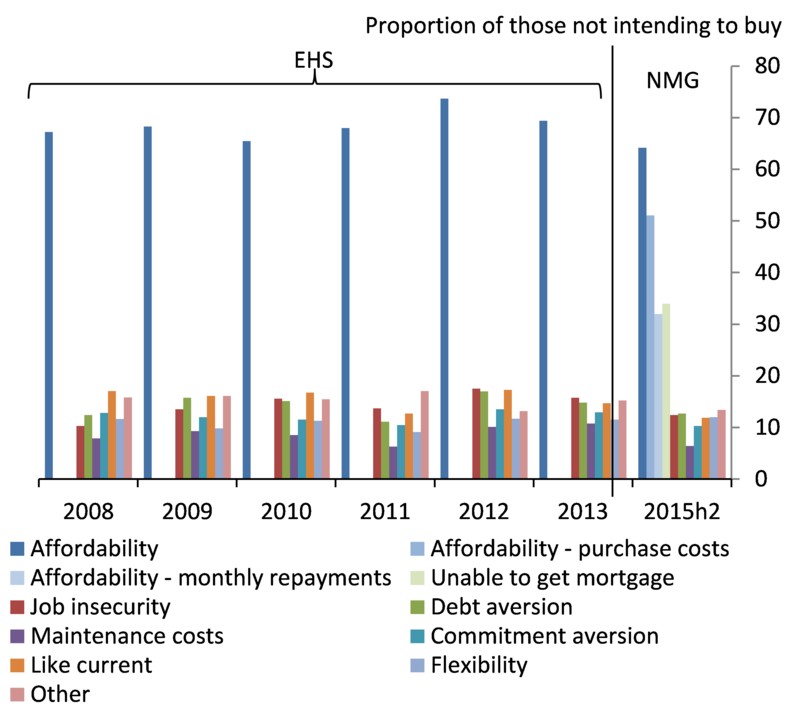 Affordability constraints are also acting on those that do intend to buy (not shown in the chart). Of those people who considered making a mortgage application but did not follow through, the deposit requirement was most quoted as the constraint. Other major factors holding back mortgage applications included reservations over whether an application would be approved and the overall costs of a mortgage, which again both have some link to affordability. In the period before the financial crisis, the most frequently cited reasons for moving house were to move to a larger house and to move to a better area (Chart 6). Each of these reasons were chosen by around one sixth of households that had recently moved. Moving for a new job and moving to a smaller/cheaper house were less frequently chosen. 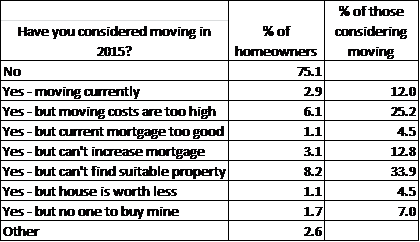 Following the financial crisis, there was a fall in the number of households who moved for all of these reasons, but the fall in transactions was particularly associated with a fall in the number of households moving to a better area or a larger house. The muted recovery in transactions since 2008 has not been accompanied by a resurgence of households moving to a better area. People moving due to the cost of their mortgage is not very frequently mentioned, although after the crisis the proportion of households citing it did pick up slightly. These results lend some weight to the idea that moving house has become less a decision of choice for households and perhaps the crisis has removed the ability for some homeowners to choose to move to a better area, for example. Chart 6: Why do people move house? Table 1: Why have people not moved in the past year? Over the past year, a lack of suitable properties is stopping people moving. The NMG survey asked homeowners whether they had considered moving in the past year and the reasons that might have put them off (Table 1). This attempts to fill a gap in the EHS which doesn’t ask anything similar. The most commonly mentioned reason was that they couldn’t find a suitable property to move to. This supports evidence from other sources that there has been a sustained period of limited secondary market supply and suggestions that people are waiting until they’ve found somewhere to buy themselves before putting their house on the market. For 25% of those considering moving, the costs involved (stamp duty, estate agent fees etc) were too high and stopped them moving. These costs are not a new feature of the market but we can’t tell without more data whether they are weighing more on households’ decisions than in the past. So, will transactions regain their pre-crisis level? Probably not any time soon. It seems likely to us that a larger private rental sector is here to stay, and with it a depressed level of transactions. For home-movers, the fixed costs of moving house are unlikely to change much, although the stamp duty changes introduced in late 2014 have made the tax burden smaller for the majority of house purchases in England & Wales. For transactions to pick up, we would need to see higher incomes and improved confidence, so households choose to move more often. An increased housing supply would also make it more likely to find a suitable property. A pick up in transactions for these reasons is likely to be slow. For first-time buyers, we expect the issue of affordability to persist. Increased availability of low deposit mortgages could help but are easily outweighed by continued house price increases. If we saw income of this group grow faster than average and in particular, outstrip house price inflation, then that may ease the affordability issue. Lizzie Drapper and Hasdeep Sethi work in the Bank’s Structural Economic Analysis Division. Unfortunately you can’t draw a finite conclusion from Table 1 as the major category, lack of suitable property may actually only be temporary, i.e it doesn’t mean that there will never be a suitable property, just that they haven’t seen one yet, so one may come up in the near future. Therefore saying “a lack of suitable properties” shows a sustained period of limited secondary market supply is misleading from these data, because it is so time dependant.